Red Bank Flavour is proud to present the First Annual Red Bank Cocktail Week, a weeklong celebration of libations slated to kick-off August 10 at Red Restaurant & Lounge and which will conclude with the Red Bank Flavour Food & Wine Walk on Sunday, August 17. The week will include signature events like a Bartender Mix-off at Taste, a Tito’s Handmade Vodka infusion class at Pazzo, Whiskey Wednesday at The Downtown, a town-wide celebration of National Rum Day, and much more. Red Bank Flavour is proud to present the First Annual Red Bank Cocktail Week. 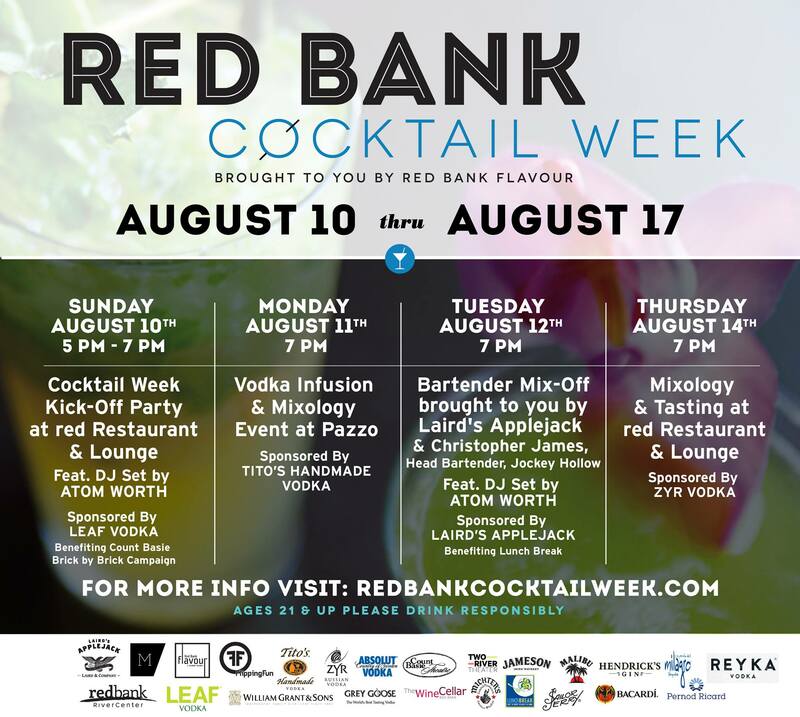 The weeklong celebration of libations is slated to kick-off August 10 at red Restaurant & Lounge and will conclude with the Red Bank Flavour Food & Wine Walk on Sunday, August 17. With signature events like a Bartender Mix-off to benefit Lunch Break, sponsored by Laird’s Applejack at Taste, a Tito’s Handmade Vodka infusion class at Pazzo, Whiskey Wednesday festivities at The Downtown, a town-wide celebration of National Rum Day, and a bevy of happy-hour specials, the week promises to offer fun and festive events throughout Red Bank. Restaurants and sweet shops are also joining in on the fun, offering mock-tails, pairing menus and liquor-infused desserts throughout the week. Red Bank Cocktail Week aims to celebrate the town as a premier destination for beverage enthusiasts and epicureans. From fine wines and eclectic muddled creations to classes and competitions, the diverse selections offered at each participating venue will keep guests’ taste buds tempted. Venues participating in or sponsoring Red Bank Cocktail Week include but are not limited to: Bistro at Red Bank, Char, Danny’s Grill & Wine Bar, Dish, The Downtown, The Dublin House, Flipping Fun, Front Street Trattoria, Lil’ Cutie Pops, The Melting Pot, Pazzo, red, Siam Garden, Sugarush a Sweet Experience, Taste, Teak, The Wine Cellar at Red Bank and Whipped Bites. Interested parties can find more information about ticket sales and event details by visiting www.RedBankCocktailWeek.com. Launched in the fall of 2011, Red Bank Flavour is a culinary-driven campaign that spotlights Red Bank’s bustling restaurant, bars, lounges and eateries. It encourages everyone from bar and restaurant-goers, foodies, wine enthusiasts and farmers-market fans to get a taste of Red Bank’s one-of-a-kind Flavour. The campaign features nightly specials and promotions, special events, fundraisers and more. For additional information, please visit www.RedBankFlavour.com.